The episode opens in the gym where a match is being organised. The captains elect the players for their teams. At the end, the only ones left are Jeremy and a slightly chubby student named Todd. Todd is chosen and Jeremy is placed in the other team by default, the one without Odd and Ulrich. He leaves the gym with a heavy heart. He tries to cheer himself up but, faced with his friends' lack of understanding, he seeks refuge in his room. When Aelita comes to see him, the boy isn't in a good mood. He's almost wishing XANA would attack. Aelita tries to ask him why but without any success. Jeremy then hides in the factory. He crouches in a scanner but realises that his behaviour is immature. He thinks about how he fought with his best friends over a basketball game. In the lab, a rat climbs onto the keyboard. It's XANAfied! It launches Jeremy's virtualisation. 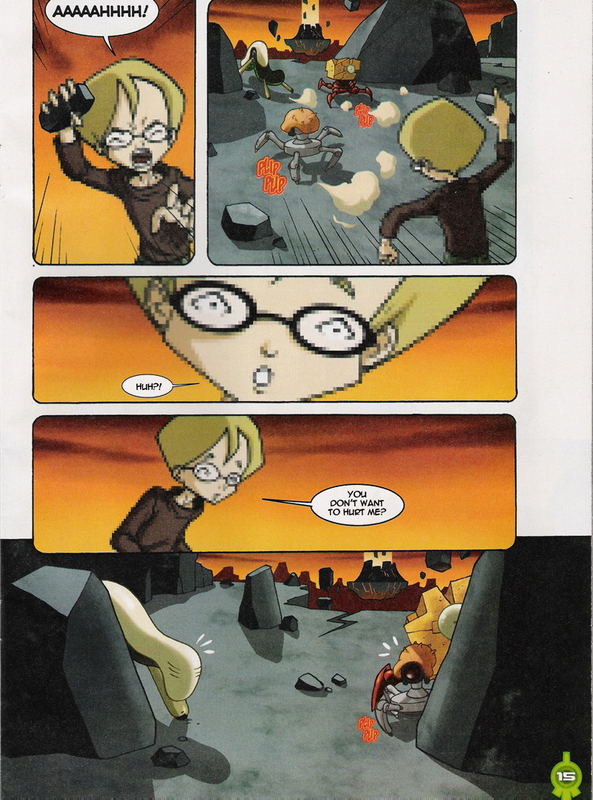 The boy appears in the Volcano Replika (from the Wii game). On Earth, the other heroes start to lok for Jeremy. 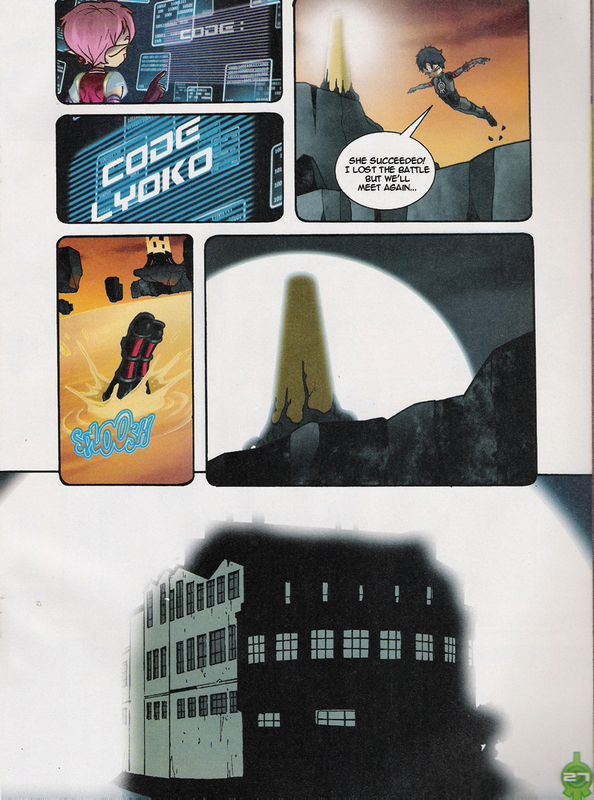 In his room, they notice that a tower has been activated and head for the factory, certain they'll find Jeremy there. 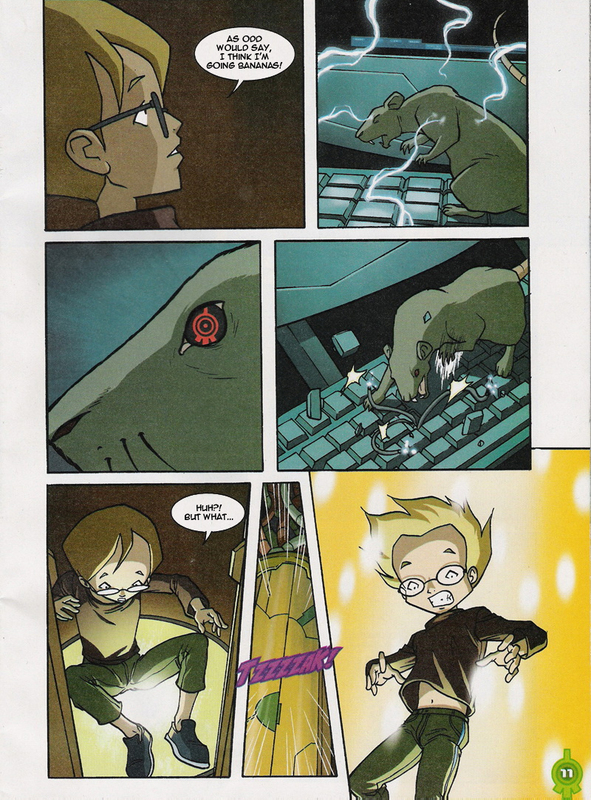 On Lyoko, Jeremy comes face-to-face with a Tarantula, a Kankrelat and a Blok, all deformed. As they seem more frightened than aggressive, Jeremy understands that they too have been rejected for their strange bodies. Jeremy sympathises with the monsters…bu William arrives and threatens him. Jeremy's new friends stand between the blond and William to protect the bespectacled boy. William kills them with a single swing of his sword. Nonetheless, it bought Jeremy time, he hears his friends arrive in the lab. After opening the door, sabotaged by the rat, Odd knocks the creature out with his skateboard. The heroes hear Jeremy's cries, calling for help. 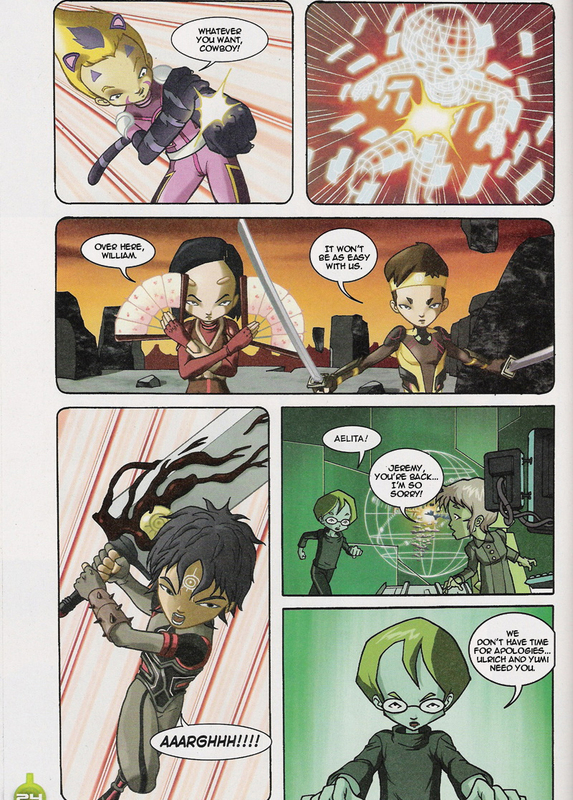 Aelita takes the commands and virtualises Ulrich, Odd and Yumi before preparing a delayed virtualisation for herself. Odd devirtualises Jeremy with a laser arrow. Unfortunately, William is strong. Ulrich falls to an unstoppable assault. He blocks a vertical swing from William's huge sword before being devirtualised by a backswing. The XANA Warrior then dodges the fans thrown by Yumi. 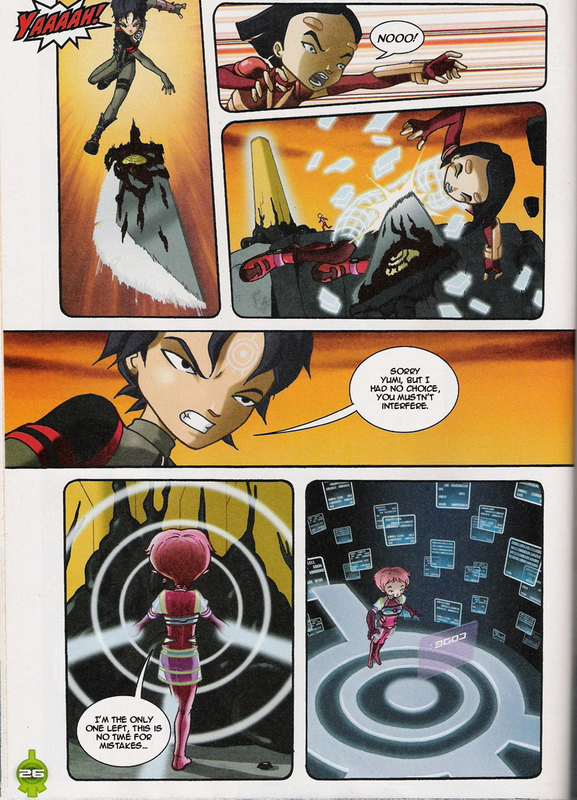 As Aelita appears and runs to the tower, William throws his sword at her. Yumi is the one who receives it straight to the abdomen to save her friend. But the deed is done and Aelita's in the tower. She deactivates it while William laments and dives into the Digital Sea. The return to the past is launched. When the match is played again, the heroes have Jeremy in their team. They lose. 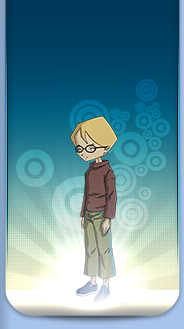 Jeremy concludes the episode however by saying that unlike Lyoko, on Earth, defeat doesn't matter all that much. - Attack: XANAfy a rat to sabotage the lab and virtualise Jeremy. - This comic takes place in season 4. 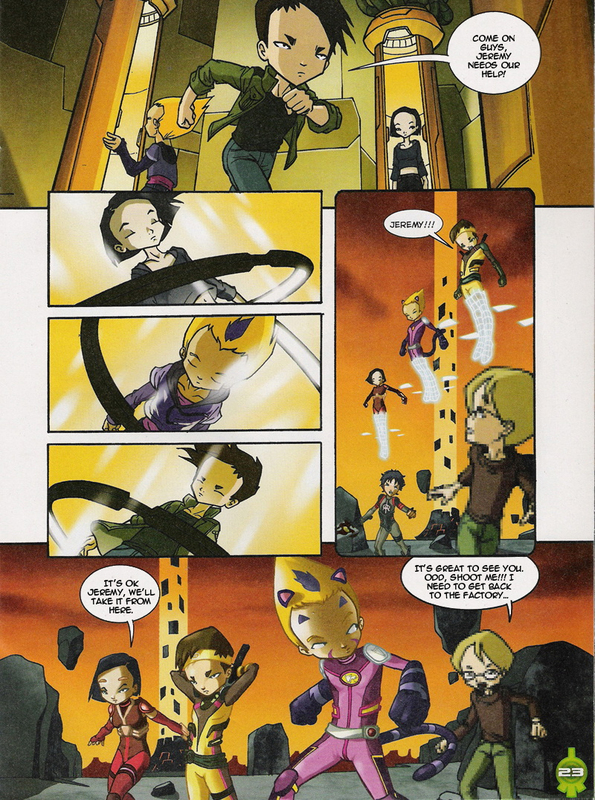 William is under XANA's control, the virtual and Lyoko outfits are the season 4 ones. - Only appearance of a comic-only character: Todd. - Jeremy is bothered by his poor performance in sports. - William apologises before devirtualising Yumi. In the series, this adds to hypotheses from certain fans that the real William still has an influence on the bad through his love for Yumi. - Although he was virtualised against his will, Jeremy should have had his subconscious analysed and ended up in a virtual form instead of his Earth one. This may be due to a bug in the virtualisation however, as it was performed by a rat. - The activated tower's halo is blue instead of red. 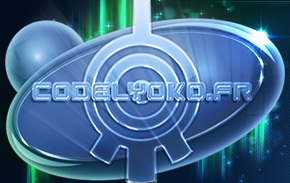 - Just after devirtualising Jeremy, Odd is no longer on Lyoko, but wasn't devirtualised, and Jeremy forgets to mention him when he tells Aelita that Ulrich and Yumi need help. - At the end, Jim's pants are red instead of dark blue. - Odd's hair splotch disappears in certain panels. - The XANAfication of a rat was used in episode 11 “Plagued”. - Only appearance in the whole series of deformed monsters. - The Volcano Replika was never in the series and didn't exist. It's a bonus from the Wii game. Tony Parker is a French basketball player, previously a rapper. Jim: Children, in two weeks the interschool basketball championship will be held. Jim: I'm counting on you to pound your enemies into dog meat…you'll start by choosing teams. Narrator: But I'm hopeless at gym! Gym is like a virtual world where everything works the opposite way to reality. Odd: Hey Jeremy, where are you running to? Odd: What, are you saying that Ulrich has a pea-sized brain? Is it because you weren't picked for our team? Is that it? Ulrich: Hey Jeremy, don't blame us, but you're not exactly Tony Parker! Jeremy: Yeah, you're right, ok well…bye! 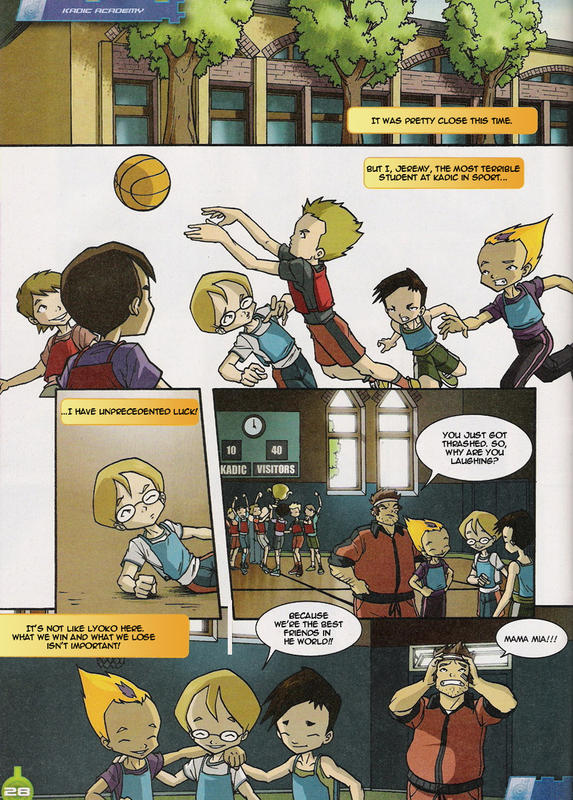 Narrator: Sport class is a crueler world than Lyoko! Jeremy: How annoying! No activated tower. No William in sight. Everything's calm. (thinking) What's gotten into me? I'm almost wishing for XANA to attack! Aelita: Jeremy? Are you ok? Jeremy: Yeah, you could say that. 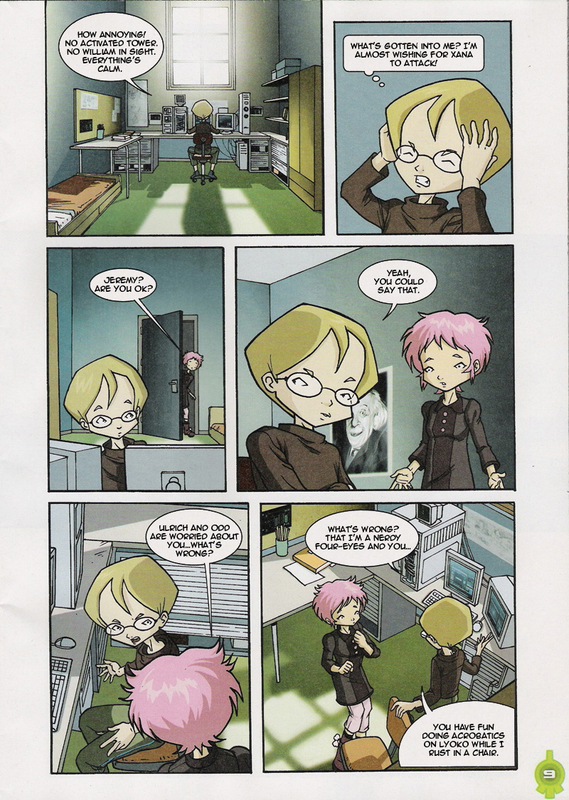 Aelita: Ulrich and Odd are worried about you…what's wrong? Jeremy: What's wrong? That I'm a nerdy four-eyes and you…you have fun doing acrobatics on Lyoko while I rust in a chair. Aelita: Do you really believe that? 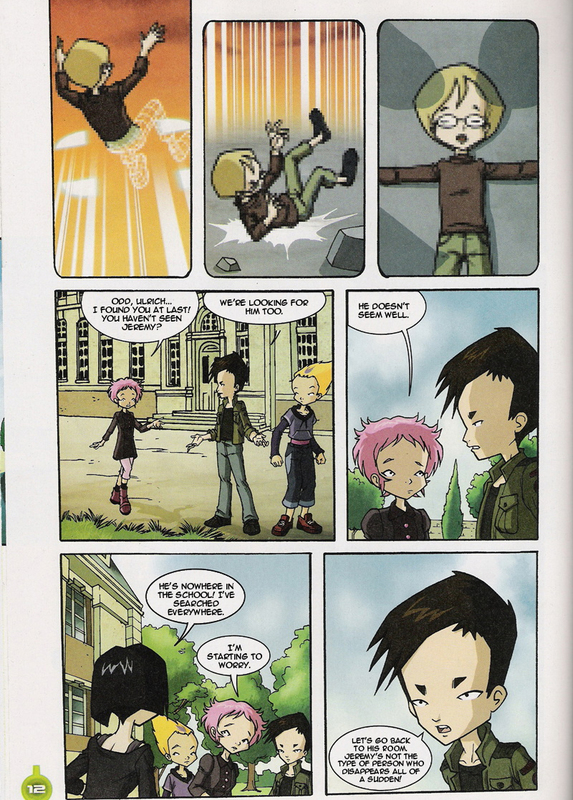 Aelita: Ulrich, Odd…I found you at last! You haven't seen Jeremy? Aelita: He doesn't seem well. Yumi: He's nowhere in the school! I've searched everywhere. Aelita: I'm starting to worry. Ulrich: Let's go back to his room. Jeremy's not the type of person who disappears all of a sudden! Jeremy: Ouch! Where… I'm on Lyoko!!!! Amazing! WOW! Slowly! Stay where you are! Ulrich: Go on, start in there! Yumi: I'm beginning to worry. 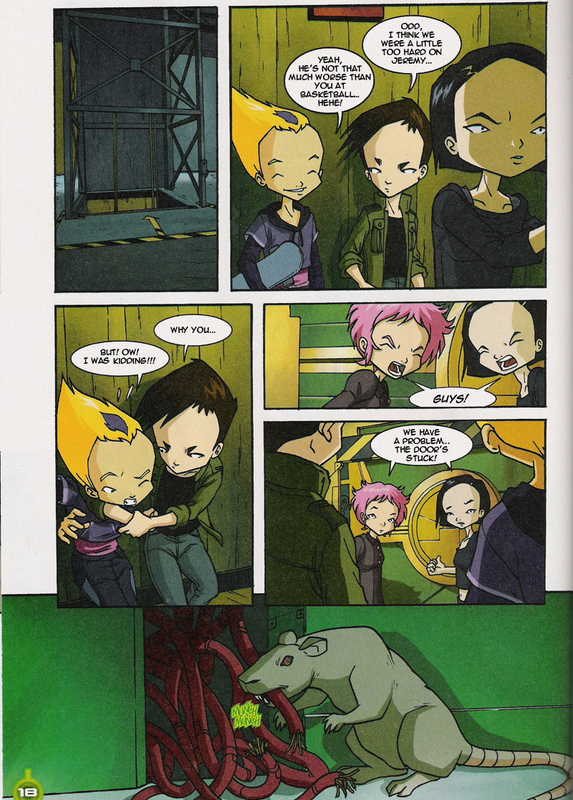 Aelita: Rats! XANA's activated a tower. Odd: Well there's only one place Jeremy would've done! 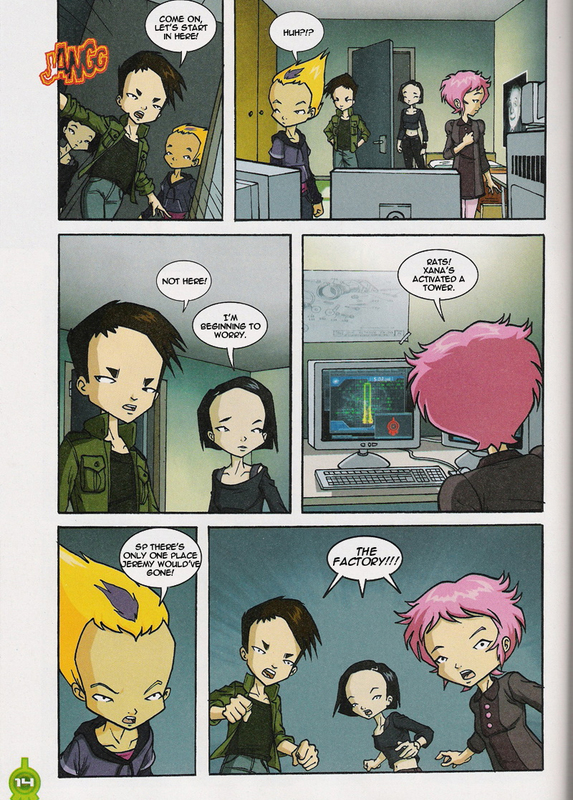 Aelita, Ulrich and Yumi: THE FACTORY!!! Jeremy: AAAAAHHHH! Huh?! You don't want to hurt me? Ok…if you don't want to hurt me, tap the ground twice. Great! I'm communicating with Lyoko's monsters. Ok…if you want to be friends, go over to that rock. Well! I think we understand each other. You seem broken! Is that why you were abandoned here? You guys feel inferior too. Uh-oh! William! Odd: Yeah, he's not that much worse than you at basketball…hehe! Odd: But! Ow! I was kidding!!! Yumi and Aelita: GUYS! We have a problem…the door is blocked! Ulrich: Come on! One more push. Aelita: JEREMY, Jeremy where are you? Aelita: Jeremy? You're on Lyoko? Jeremy: I don't know what happened…and I'm here in this strange form! Aelita: XANA took control of a rat from the sewers! Jeremy: I understand now! This is what happens when you're virtualised by an amateur. Ulrich: Come on guys, Jeremy needs our help! Jeremy!!! Yumi: It's ok Jeremy, we'll take it from here. Odd: Whatever you want, cowboy! Ulrich: It won't be as easy with us. Aelita: Jeremy, you're back…I'm so sorry! Jeremy: We don't have time for apologies… Ulrich and Yumi need you. 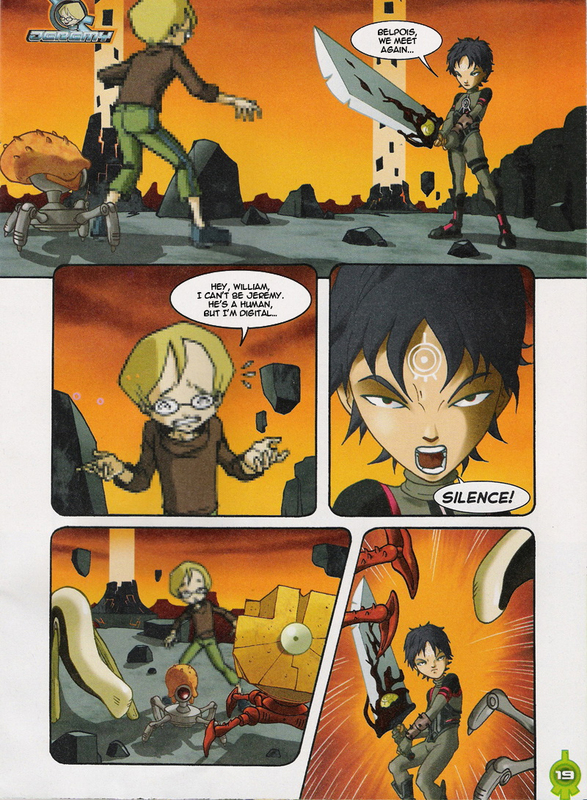 XANA-William: You might be smart in the real world, Ulrich… But on Lyoko, I'M the strongest! XANA-William: No…not the tower…not now! YAAAAH! XANA-William: Sorry Yumi, but I had no choice, you mustn't interfere. XANA-William: She succeeded! I lost the battle but we'll meet again. Narrator: It was pretty close this time. But I, Jeremy, the most terrible student at Kadic in sport… …I have unprecedented luck! Jim: You just got thrashed. So why are you laughing? Jeremy: Because we're the best friends in the world!! Narrator: It's not like Lyoko here. What we win and what we lose isn't important!